India has decided to extend its National Knowledge Network to Bangladesh. 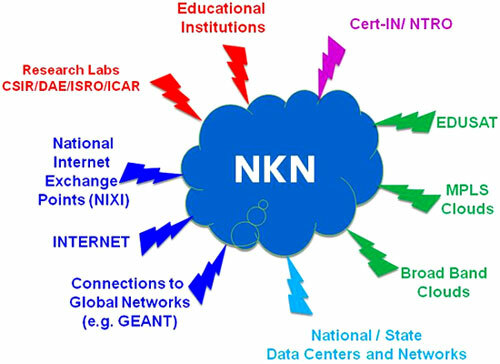 With its multi-gigabit capability, NKN aims to connect all universities, research institutions, libraries, laboratories, healthcare and agricultural institutions across the country to address such paradigm shift. It enables collaboration among researchers from different educational networks such as TEIN4, GARUDA, CERN and Internet2. It also enables sharing of scientific databases and remote access to advanced research facilities. The leading mission oriented agencies in the fields of nuclear, space and defence research are also part of NKN. Establishing a high-speed backbone connectivity which will enable knowledge and information sharing amongst NKN connected institutes. Enabling collaborative research, development and innovation amongst NKN connected institutes. Facilitating advanced distance education in specialized fields like engineering, science, medicine etc. Facilitating an ultra-high speed e-governance backbone. Facilitating connection between different sectoral networks in the field of research.